In a capital city where land is scarce and prices are high, YNH Property Bhd has something many property developers can only envy — a three-acre freehold parcel on Jalan Sultan Ismail in the heart of Kuala Lumpur’s Golden Triangle. The land, widely touted as the Menara YNH development, was left untouched after several development attempts fell through since it was bought over in July 2004. However, the company’s recent announcement has got property enthusiasts and investors excited again. Last month, YNH announced that it had signed a memorandum of understanding (MoU) with Hilton Worldwide Manage Ltd for the proposed Hilton Kuala Lumpur City Centre & Residences. “We signed an MoU with Hilton. Now, we are in the midst of getting the agreement sorted out. We are also making some amendments to certain components of the development,” says YNH head corporate strategy and director Daniel Chan. YNH plans to construct two branded hotels, one retail podium and two blocks of serviced apartments, which will bring the land’s combined gross development value (GDV) to RM3.2 billion, a windfall compared with the RM63 million it paid for the land. The company has not committed to any timelines for the completion of the project and said that it is in no rush to do so. According to Chan, land within the city centre is trading at RM3,500 to RM3,700 per sq ft. But, having Hilton knocking on the front door of the development should be a significant morale boost to the company and its investors. It helps put an end to suspicion that the land is not suitable for development since it is part of a slope and has three water pipes running below it. “Contrary to rumours, we have obtained a development order and all the necessary approvals for the construction. There were concerns about the water pipes running beneath the land but that matter has been resolved. The authorities have allowed us to relocate three water pipes outside the boundary of the land. If there were issues, Hilton would not have come in,” Chan explains. More importantly, Hilton’s involvement has assured investors that the project will go on after years of start-stop progress. Recall that YNH first bought the land from Pengurusan Danaharta Nasional Bhd for RM63 million or RM482 psf for the construction of a 55-storey office block, two 56-storey serviced apartment blocks and a 50,000 sq ft retail podium. The GDV of the project was RM880 million. In 2006, the company signed an MoU with Singapore’s CapitaLand Ltd to jointly develop the land on a 60:40 basis. The construction should have begun in mid-2007 and been completed by end-2011. However, in June 2007, the MoU lapsed. YNH then found a new partner, Kuwait Finance House (M) Bhd (KFH), in January 2008. The plan was to sell half of the project or 750,000 sq ft to KFH for a record sale price of RM1,230 psf or RM920 million. This, too, fell through as KFH pulled out before the formalisation of a sale and purchase agreement in the wake of the 2009 global financial crisis. After two strikes out, YNH decided to take charge of the development instead of leaving it to foreign partners. “I think YNH has come a long way. We have done high-rise developments, which we have completed. So, I believe we can move on with the Menara YNH project on our own as long as we get good anchor tenants for our hotels and retail space. If they are there, then we can build,” Chan says, adding that the plan is not to sell any of the properties on the land but to keep them as a source of long-term recurring income. “We are not selling. Currently, the plan is to get partners that will operate it for us. If we can get partners that can give us the yield, we can get borrowings from the bank to build. The returns from the retail lots and hotels can help us pay off the loan. 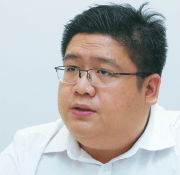 For the company, it will have recurring income,” says Chan. With Hilton, YNH is taking a step forward and progressing slowly with the development. However, much is hanging in the balance. For now, the company wants to focus on developing its existing landbank of 1,300 acres in Perak and 30 acres in the Klang Valley, which its executive director Datuk Dr Yu Kuan Chon and managing director Datuk Yu Kuan Huat have amassed. Kuan Chon holds a 15.71% direct stake and a 16.44% indirect stake in YNH while Kuan Huat holds a 12.62% direct stake. In terms of earnings growth, YNH has seen fairly consistent earnings annually. Its revenue grew from RM269.24 million in FY2012 to RM390.19 million last year. Meanwhile, its pre-tax profit was RM63.88 million in FY2012, RM60.58 million in FY2013 and RM69.26 million in FY2014. This year, YNH is kept busy with the launch of two developments — the Sfera Residence @ Puchong South and Kiara 163 in Mont’Kiara. The projects have a combined GDV of RM1.65 billion. This article first appeared in The Edge Malaysia Weekly, on March 9 - 15, 2015.